Every year since 2002, you’ve read about Born to Run in the Viva Life! newsletter. Many of you have generously donated money and time to make this event a mainstay for the Right To Life Committee of New Mexico’s Educational Trust Fund. Have you ever stopped to wonder how the race originally got started? The following article, penned by Beth Chavez, tells an inspiring story. It’s good to know that God’s spirit of unselfishness and His will for us to speak out against wrongdoing is alive and well, especially in the heart of Leroy Chavez. The sight that lit a spark into this God-fearing man was a simple headstone dedicated to the unborn – one that the Knights of Columbus Council in Glasgow, Montana erected well over 15 years ago. Saddened by the loss of so many lives, Leroy wondered what more could be done to shed light on this ‘politically incorrect’ topic. What could one man do for the helpless? As a Special Agent for the federal government, one must keep fit. Thus,on one of Leroy’s many runs the idea hit him like a brick: A run to save lives, not for animals, not for research, but for the least of these, the unborn, was conceived. With no previous racing experience, Leroy researched the many facets of coordinating a race and discovered it would take much more than one man could accomplish. He would need much more support bodily and financially. Who could he turn to in order to achieve his goal? Who had the same drive and belief that abortion was indeed wrong and people needed to be educated? Who was themselves speaking out against it publicly? The Right To Life Committee of New Mexico was the public voice he heard, and thus, in 2001 he proposed the idea to the RTLCNM state board. Born To Run, rooted in the will to educate society, was itself born in the fall of 2002. The wish to make it a reputable race, one that would grow throughout the years, drove the Born To Run committee to lay the groundwork for a family themed race. Games, prizes, race awards, guest speaker, face painters, race coordinator, timing chips, balloon jump, and DJ were all part of the plan. The race has grown through the years and has changed its venue as well. It started out with a 5k and a 1-mile run/walk and has now evolved to a 10k, 5k run/walk, 1mile run/walk and a toddler trot. Kit Carson Park and Tingley Beach was the original location for Born To Run. Balloon Fiesta Park was the second site chosen for the race, and the third and favorite site is along the Bosque beginning at Sagebrush Church. The scenic fall leaves and the cool shade they provide are a runner’s delight. Today, ten years from its beginnings, Born To Run, has maintained that family centered theme and remains a well-organized race. The stakes are, however, about to be raised. This year the Born To Run committee has a goal of 1,000 runners and $20,000 in sponsor donations. This goal has not been taken lightly, and the push to educate the public about the birth options available is the strongest in the ten-year history. There are several groups registered for tables at the race to give out information about these choices, including Birthright, The Gabriel Project, Project Defending Life, and many more. The dream of one man, one child of God, has become a reality. Ten years and many countless hours dedicated to helpless infants has produced good fruit. We are all called do our part to help the least of these. One man answered the call. You, too, can do great things. Can we count you among those called to action to support this Pro-Life event and its message? There are many ways you can participate: by donating, volunteering at the event, participating, and spreading the word about this event to friends and family. 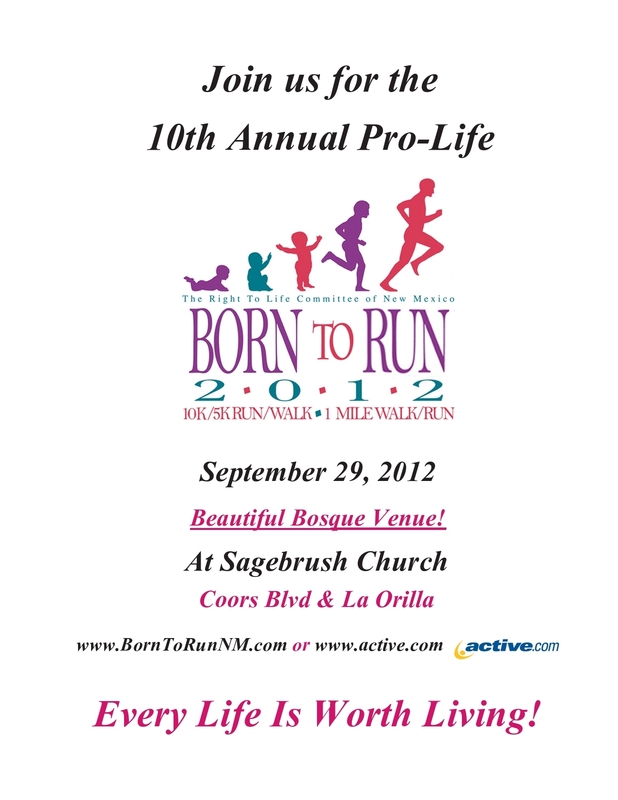 Visit our website at www.borntorunnm.org to hear the story, register to run/walk, volunteer, or donate. We look forward to your participation!